Workout Anytime is one of our national partners. 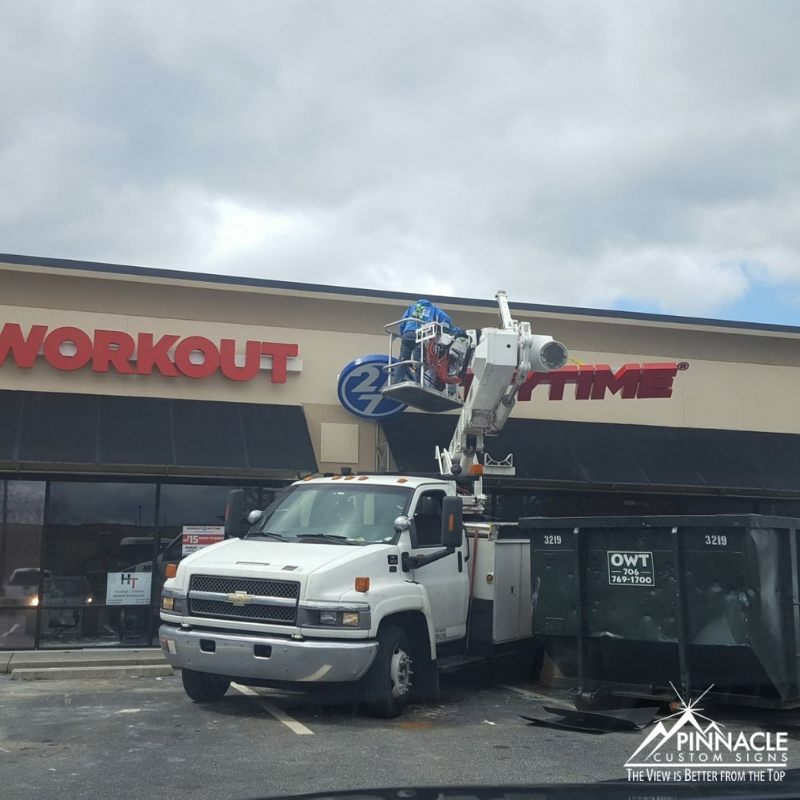 We have helped install a variety of signage at many of their locations in the North Georgia area and beyond. One example of our work is the location signage for their Winder, GA location. Workout Anytime is a gym that is open 24 hours a day, 7 days a week. They are emphasis convenience by offering a low monthly membership cost, having easy parking, gyms close to their customers, and being open all hours for their members. They also have added benefits, like their coaches and special equipment. Special equipment includes things like HydroMassage units and reACT Eccentric Anaerobic Core Trainer. Coaching opportunities include monthly fitness evaluations, certified personal coaching, and MX4 Small Group Training to name a few. We assisted the Winder location in a variety of signage, but their building sign was a key part of their location branding because of their location on Atlanta Hwy. Individuals passing by in their vehicles can easily identify their location because of the clear design of the channel lettering. The monument sign is also easily seen from either direction. In addition, they are conveniently located next to a Winder Walmart Supercenter. Our signage installation team proved their skill when installing the outdoor sign because of a sudden change in the weather. The temperature dropped by 30 degrees in addition to it being windy. Plus, the location was still being built out so other crews and equipment were present and had to be worked around. While it took longer to do the installation, our team successfully installed the new channel letter sign. The installation of the sign helped drive traffic and build interest in the location even while they were under construction. After much of the construction was complete, we returned to install the wall graphics, window graphics, and additional signage before the grand opening. 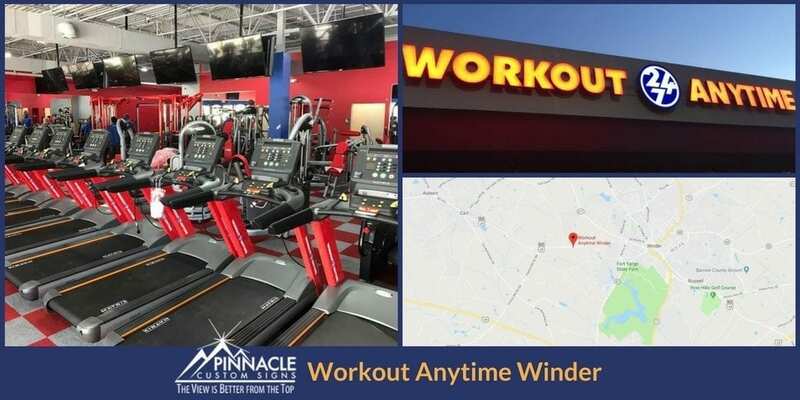 Their storefront location next to a Great Clips and Subway made the window graphics a valuable resource for informing potential customers about what Workout Anytime is and driving traffic. The marketing strategy for the grand opening of the Winder location is a great example for other businesses to follow. Instead of waiting until their location was open for business, the Winder store owners started building awareness and buzz. Coroplast signs (yard signs) at key locations around and leading to the location advertised the “Coming Soon” and grand opening of the store. With the Walmart Supercenter in close proximity, a large number of Winder residents saw the signage. They brought in a Workout Anytime RV to the location in the weeks leading up to the grand opening so that they could sign up new members. They were also very active on social media – posting updates and photos about the location’s progress and about the membership benefits. And they had a table out at local events with information. By the time the location officially opened for business, they already had a good member base and had built awareness throughout the community. Pinnacle Custom Signs is more than a simple sign manufacturer and installer. We work with businesses to create custom signage solutions for their unique situation. We pay attention to every detail. By working closely with businesses to understand their goals, we are able to offer a variety of options to suit their needs. We have had the pleasure of working with Workout Anytime on a number of different projects for different locations. Our company offers them the ability to ensure that their brand standards are met whether it is at the location just down the road from us or hundreds of miles from us. 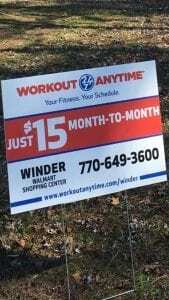 Looking for a sign company close to Workout Anytime Winder? We’re not far away!